Well this weekend was a blooming special one. Andy was asked to photograph the wedding for his cousin James, who was marrying the lovely Kay. 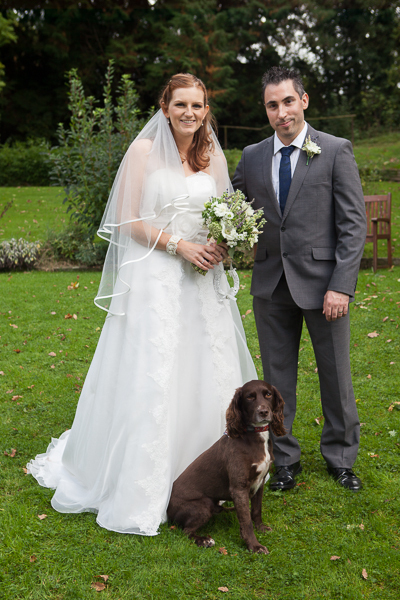 The wedding took place at The Park Hotel in Pandy, Abergavenny Wales and everyone had a fantastic day. As it was a family wedding Andy said I had been invited too. To my surprise James and Kay requested to have a photograph taken with me, lucky me. I'm looking forward to seeing the rest of the photo's but as I'm only in one I'm sure the rest aren't as good. If your getting married and would like to know more about having Andy Photograph your wedding please Click Here for more information.